The Power Of Words, an anthology of stories centred on the First Amendment, is now available for pre-order at 99c/99p. Four futuristic, apocalyptic and fantasy stories by four authors‌—‌myself, Richard T. Drake, Heidi Angell and M.L.S. Weech. The e-book will be released on 1st October, with paperback and audio versions also available around that time. I got into listening to podcasts a few years ago, roughly when I started writing seriously. Initially, it was a way of learning about this whole writing and indie-publishing thing‌—‌The Creative Penn (amazing to consider that Joanna Penn has been putting this podcast out for over nine years now), The Self-Publishing Podcast (now re-branded as The Story Studio), and the sadly no longer running Rocking Self-Publishing. Over the years, I’ve expanded the list of podcasts I listen to on a regular basis (and when I find a new one, I’ll usually listen to their whole back-list too). Many focus on writing and publishing, and this is my main way of keeping up to date with what is happening, as well as continually learning. But I also listen for the enjoyment, and I’ve branched out into other podcasts. One of these is Helen Zaltzman’s The Allusionist. She brands it as ‘a podcast about language’, and that pretty much sums it up. She’s done episodes on the Rosetta Stone, how one area of Argentina speaks Welsh, messages on dating apps, letter-writing, the BBC shipping forecast, swearing, eponyms‌‌…‌‌the list goes on. But I thought I’d single out the latest episode, because it deals with reading. I’ve always considered reading to be far more than simply a way of being entertained, but this episode (A Novel Remedy) looks at some of the mental health benefits of reading. Reading can help cure or alleviate psychological problems. Helen talks to a clinical psychologist who uses novel-reading with her patients. She also explores why murder mysteries written by the likes of Agatha Christie and Dorothy L. Sayers were so popular‌—‌and so helpful to the mental state of readers‌—‌in the years after the First World War. It’s a very interesting listen, and you can find it here. And if you’re interested in language and words, I’d recommend you pop over to The Allusionist’s website and give some of the other episodes a listen. As a method of taking in entertainment, reading has a lot of competition‌—‌music, film, TV, video games, as well as the plethora of entertainment available on-line. These are all arguably more immediate than reading. With the possible exception of video games, reading is the only one that cannot be consumed passively‌—‌it requires effort, in concentrating on the words and making sense of the sentences. And it takes timeva three-minute song, a ninety-minute film, or a five-hour novel. Sometimes, it feels that reading is becoming a lost art. Libraries are struggling here in the UK, and many have closed. High-street bookstores are disappearing too. But reading is far from dead, and this was brought home to me recently on holiday. It started at the airport, and then on the plane‌—‌with hours of time to fill, passengers turned to books. And at the hotel, the popularity of reading became even more obvious. We spent quite a bit of time by the pool, and I’d often glance around to see what others were doing. Many were sunbathing, with eyes shut. Some were talking. Others swam. And a high number of holidaymakers were reading. Whenever I counted up, there were more people reading than there were in the pool. Let that sink in for a moment‌—‌at a hotel pool, reading was a more popular activity than swimming. I took a surreptitious look at what people were reading. The books ranged wide. I saw Stephen King, but also China Mieville. Judging by the covers, there were thrillers and romance alongside contemporary/literary fiction. A few looked like biographies. Someone even produced a book of sheet music and read this, humming to himself. Then there were the electronic readers. I’m assuming that many were Kindles, although I did see one Kobo (and that made me feel good‌—‌as much as I love my Kindle, it’s good to know that Amazon does still have competition). And then there were the phones. Of course, that phones are capable of so much more than displaying e-books. Some people round the pool wore headphones and held their phones in landscape mode, and I assume they were watching videos. Others tapped away, presumably either on games or social media apps and sites‌—‌although maybe they were writing. But a large number of phone-users held their devices in portrait mode and tapped only occasionally‌—‌the same behaviours as those using e-readers. I have to assume that these people were reading on their phones. Not all this reading was solitary, either. At one point, a couple sat on a couple of loungers and both produced books. After reading for a few minutes, he passed his book over to her, pointing to a particular passage. She read this, and made some comment on it. I wondered if they’d swap books as their holiday progressed, and if they’d spend time in the evenings discussing what they’d read. But holidays are not everyday life. Some people might say this is not evidence that reading is popular. Those who read by the pool might read nothing else for the rest of the year. This could be true‌—‌but doesn’t that make reading something special? These people were on holiday, taking time out of their normal routines. They chose to relax in the sun by a pool, and as part of that relaxation they chose to read. Books might not be something they turn to every day, but they are reserved for special occasions. They are a way to unwind, to forget the day-to-day troubles. If someone only reads on holiday, that shows how they value reading as an exclusive activity. Maybe those on the plane and at the airport read because they had too much time trapped in one place‌—‌but they still chose to read. Just like those who read on their daily commute to and from work, they chose to consume books to pass the time. They chose to take their entertainment in written form. And maybe some of those holiday-makers (many of them?) were like me‌—‌using time by the pool as an opportunity to indulge in one of their favourite activities. I love reading novels, but occasionally I’ll get an anthology of short stories. I’m usually drawn to a particular title by one or two authors who I enjoy, but there are always stories by others I’m unfamiliar with. These anthologies are fantastic opportunities to try new writers without committing to hours of reading a novel would take. I’ve submitted short stories to anthologies (and there’s one coming out in October that I’m very excited about), and a large draw is having new readers discover my work. Hopefully, a few readers will enjoy my stories enough to check out (and buy) my novels. But there is another benefit to writing short stories, and that is the opportunity it presents to experiment. I want to improve as a writer, and that means pushing myself outside my comfort zone. That might mean trying a new genre, or it might mean trying a new style of writing. Clearly, writing complete novels for this kind of experimentation/developmental process would take too long, so I use short stories. I’d like to highlight some of these stories here. Some have been more successful than others, but all of them have helped me improve. And, as before, the comments below may contain spoilers, so you can always click on the title of each story to read it first. I’ve always enjoyed fantasy. When I first read Lord Of The Rings, I’d go to my room as soon as I was home from school and spend what felt like a few hours simply reading. I remember being excited when I found Stephen R Donaldson’s Gilden Fire (the ‘lost’ chapter from one of his Thomas Covenant books) in a second-hand shop. I used to spend hours designing Dungeons And Dragons worlds, and creating new monsters. So I wanted to try writing fantasy. I couldn’t figure out how to write a full-on epic as a short story (although I’m sure it is possible), so I came up with something smaller in scale, maybe a scene that could come from a larger story. Hopefully it stands up on its own, though. Of course, as with science fiction, fantasy can be more of a setting than a genre, so this is also simply a story of an old man doing what he can to protect those he loves. Another genre I read from time to time is thriller, and I wondered if I could manage an espionage story in under a thousand words. It took a lot of work, especially in editing‌—‌I needed to include the scene itself, but also hint at everything that had gone before. The story, like so many others, developed as I wrote it, and required a great deal of editing. This was a fun puzzle, though‌—‌keeping enough happening in the scene itself to tell its own story, but also including enough hints and references to make the larger story understandable. Overall I’m pretty pleased with how it turned out. My stories tend to be dark. There’s usually death involved, or at least pain. So I challenged myself to write something ‘gentle’‌—‌a story where nobody died, with no dark undercurrents. I wouldn’t call this romance, but it might be close. I recall wanting the dialogue to give the idea that this couple know each other well, and I think I got close to that. Maybe I didn’t totally escape darkness‌—‌after all, the idea of the perfect moment does imply that other moments are less than perfect. But there is more happiness than pain in this story. I’d already written a story using nothing but dialogue (Allegiance), but I wanted to see how far I could take this idea. I wanted a whole story that was only one side of a conversation. A monologue would have been easier, but that’s usually one person talking to themselves. I wanted another character on the other side, someone who responded to the story’s main character, but who we never directly hear. The part of the conversation we ‘hear’ had to be realistic, while at the same time the story had to hold together. On re-reading, it’s not as clear as I’d first thought. And I did cheat by having a second voice at the end (although it is through the same phone the main character used, so maybe I’m bending the rules rather than breaking them). Stories are normally written in either third person (he did this, she did that) or first person (I did this). But there’s also second person (you did this, you did that). This isn’t used much, except in ‘choose your own adventure’ books. It’s hard to write a story and convince the reader that they are the main character. Normally, books don’t address the reader at all (’breaking the fourth wall’), and second-person can feel like this the whole time. But just because something’s hard, that doesn’t mean it shouldn’t be attempted, and I’ve wanted to write a second-person story for a while now. I still haven’t managed it, but The Illusion Of Control is close. It seems to be second person at the start, but I cheat. About half-way through, it should become clear that the reader is not the main character, but that the story’s main character (or, at least, narrator) is talking to the reader. The character (and I suppose I can use that word for an AI) is monologuing, so this story is actually in first person. The content of this story was influenced by Surviving AI: The Promise And Peril Of Artificial Intelligence by Calum Chace (well worth a read), and while I’m intrigued by the ideas I brought into The Illusion Of Control, I’m not convinced it works as a story. I’ll probably return to these ideas, though (I already have something in mind). And I still want to write a second-person story. Five short stories where I pushed myself to try something different, some more successful than others. I hope you found them entertaining. If you have any comments, on these or other stories I’ve written, I’d love to hear from you‌—‌simply add a comment below. I’ve enjoyed reading horror for as long as I can remember. As a teenager, along with sci-fi and fantasy, I would devour anything by James Herbert and Stephen King. So when I started writing, it was obvious that I’d try my hand at horror. 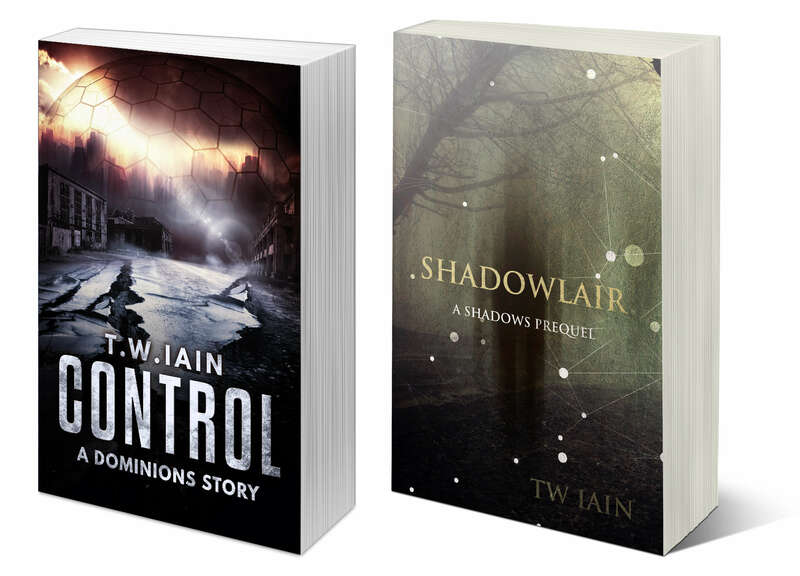 My Shadows series combines horror and sci-fi, but most of the horror I’ve written has been as short stories. There’s something about that size of story that works well in the genre. Think of Lovecraft, or Poe—‌loads of creepy shorts. And even though I read mainly novels as a teenager, I have fond memories of reading King’s short-story collections, like Skeleton Crew. I can’t recall the names of the stories, but there are tales that I still remember clearly, decades later. I think it’s because horror is more effective if it is not explained. A good horror tale will drop hints, and let our imagination fill in the gaps—‌and our own minds know what scares us far better than a writer does. That’s why films like Jaws and Alien, where the monster is not seen until some way into the film, and even then only in part, are far more effective horrors than their sequels (although to be fair, the rest of the Alien films don’t pretend to be horrors so much as action/sci-fi stories). I’d like to point you to a few of my own horror stories now, with a few words of introduction. There may be spoilers, though, so follow the links (click the titles) to read the stories first. This was the first short to appear on the website that was written in first-person, and I think that point of view works well for horror. It draws us in to the main character, and helps us experience what they are going through. Escape was influenced by Terry Pratchett. In one of his books (I can’t recall which), a wizard tries to build a death-proof box. He sets up various spells or whatever to ward of the presence of Death, and then he climbs in, only to hear a dark voice saying DARK IN HERE, ISN’T IT? Only then does he realise that a death-proof box isn’t going to work without air-holes. Pratchett tells that story far better, and it’s played for laughs. Escape takes a darker turn. Horror works well when the scary other-world aspects are at odds to an otherwise normal setting. Going back to Alien, although it is set on a space-ship, the characters are miners, and it is easy for us to relate to them as they sit around moaning about the company—‌they’re just regular workers, like us. Yes, they’re on a space-ship, but it’s a run-down workplace and home. It’s not that much different to places we know. Then into this every-day setting comes something totally unexpected. With Invitation To Dinner, I wanted things to appear very normal at the start, almost to the point of being boring. But, hopefully, various phrases stick out, indicating that all is not as it seems, until the horror presents itself at the end. This story came about from a bit of free-writing, where I started with a single idea and wrote whatever came to mind. That idea was an image of someone stepping into a room, exhausted, with blood dripping from their fingers. The story developed as I wrote, and grew tighter as I rewrote and edited (and this took a while, as the original draft was well over twice the length of the finished story). I purposely left things vague—‌is the main character deluded? Are those he’s killed aliens or zombies?—‌mainly to let the reader use their imaginations. But I also like the idea of someone doing what they know (or believe) to be the right thing, but knowing that others will recoil in horror at their actions and see them as a monster. This is another story, like Invitation To Dinner, where the horror only appears at the end, and even then it’s subtle. But in this story, I didn’t want the main characters to realise they were facing horrors—‌to them, what happens is normal. And maybe (I purposely don’t give their ages, but hopefully they come across as fairly young) it is normal, which only makes what happens more horrific. This is my first attempt at a ghost story, but I include it in this post about horror because the two genres are related (or maybe ghost stories are a sub-genre or horror). But I wanted to present this story not from the point of view of someone seeing a ghost, but from the ghost himself. I remember a story I read (or maybe it was read to us at school), where a group of children in the time of the second world war (I think) found themselves in a strange house, full of futuristic marvels. Three other children appeared, and looked at them with fascination and also fear. I can’t recall much about the plot, but I do know that the original three children had somehow gone into the future, and the children they saw were reacting as if they were seeing ghosts‌—‌three children from the past who suddenly appeared in their own house. I like this idea of someone realising they are a ghost, and this is what I set out to do in crossing. It was tough to write (or, more accurately, tough to edit)—‌a long period of time has to pass in the story, and the main character has to realise what is happening slowly. I needed to give clues without necessarily giving everything away. But I’m pleased with how it turned out. It might not be as horrific as the other shorts I’ve mentioned above, but hopefully it gives the reader a small shudder when they realise what’s going on. I’m sure I’ll write more horror shorts in the future (I think I have a couple in early drafts already), and I hope you enjoyed these ones.